A full complement of travel insurance up to 60 days. 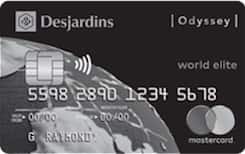 This CAD currency 34 is issued by Desjardins and runs on the MasterCard Network. The purchase interest rate for this credit card is: 19.9 percent annually and the transfer balance interest rate is: 19.99% per year. Also the cash advance rate is: 19.99% per year. Travel cancelation is Included for this credit card and also travel accidents are Included.